W&L Lives Lost in the Vietnam Era Nineteen Washington and Lee University alumni died during the Vietnam Era. These are their stories. 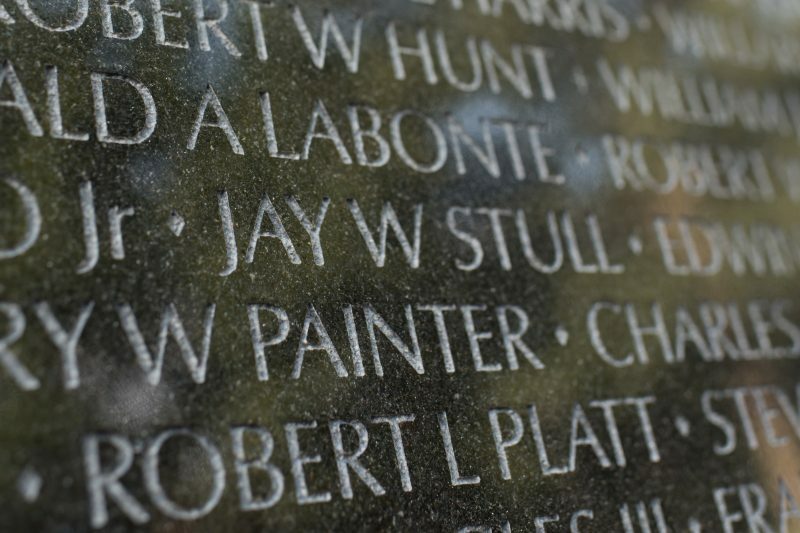 W&L alumnus Jay Stull’s name can be found on the Vietnam War Memorial in Washington, D.C.
Of the 19 W&L alumni who died during the Vietnam Era, 10 died in South Vietnam, six in the United States and one each in Thailand, Japan and Korea. Twelve of the 19 were killed in aircraft accidents (four of them in Vietnam), six were killed in ground combat in Vietnam, and one died of a brain hemorrhage. Their deaths spanned the years from 1961 to 1973, and their ages ranged from 23 to 54. Jon Price Evans ’37 was born in 1914 and was from Forty Fort in northeastern Pennsylvania. At W&L, he was vice president of his freshman class, a member of Phi Kappa Psi and wrestled in the 118-pound class. He graduated from Temple University Medical School in 1942 and served as an Army physician during World War II, Korea and Vietnam. Among his assignments in 23 years of military service were medical officer for the CIA, senior medical adviser to the Shah of Iran and the Iranian army, and senior medical adviser to the Korean army. He retired as a colonel in 1967 and became the State Department’s Southeast Asia medical officer, based in Bangkok, Thailand. On Jan. 5, 1969, he was traveling on official orders to Vientiane, Laos, when his chartered DC-3 airliner developed engine trouble and crashed just across the Mekong River in northeast Thailand while trying to make an emergency landing in Vientiane. Evans, 54, and three others were killed. His wife, with whom he had two grown daughters, survived the accident. He was buried in Arlington National Cemetery. 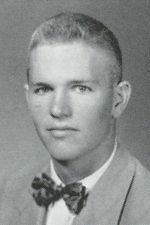 Thomas Alexander Nalle Jr. ’54 was born in New York in 1932 and lived in St. Davids, Pennsylvania, outside of Philadelphia. He was a member of Phi Kappa Psi and the “13” Club at W&L. He was a Marine Corps aviator stationed at Cherry Point, North Carolina, on April 18, 1968, when his aircraft plunged into Pamlico Sound in Hyde County, North Carolina. Nalle died instantly. He was 36 and married. He was buried in Saint Martin’s Episcopal Church Memorial Garden in Radnor, Pennsylvania. William Wakefield Roush ’56 was born in 1934 and grew up in Houston, Texas, the son of a department manager at Westinghouse Electric Co. 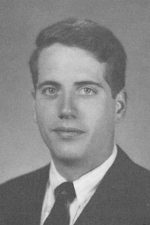 He belonged to Delta Tau Delta at W&L and transferred to the University of Texas after his father died of a heart attack in April 1954. Rouse graduated in 1956 and entered the Army as a second lieutenant. He rose over the next 12 years to the rank of major in the Green Berets and served three tours in Vietnam. 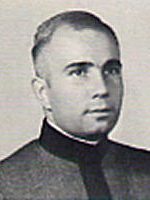 He was awarded a Distinguished Service Cross (second only to the Medal of Honor) for rescuing the crew of a downed helicopter on January 5, 1968, north of Saigon. He received a second DSC for crawling into the path of enemy fire in an attempt to rescue trapped colleagues on February 27, 1968, near Saigon. “While trying to reach the platoon’s casualties, his group was detected, and the enemy opened up with brutal small arms fire, mortally wounding Major Roush,” his second DCS citation read. Willie Gin wrote in Manchu Diary: “Among the infantry officers I knew in Vietnam, Major William Wakefield Roush stood out as one of the best. He also was an outstanding Green Beret.” Roush, 34, was married with a young son. He was buried at Arlington National Cemetery. 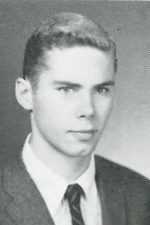 William Michael Akers ’58 was born in 1936 and grew up in West Palm Beach, Florida, the son of an engineer. He was a member of Delta Tau Delta at W&L. A lieutenant (junior grade) in the Navy, he and his co-pilot were killed on April 11, 1961, when their Navy Skyraider plane crashed and burned north of Hunter Liggett Military Reservation in King City, California. A rescue party reached the wreckage the next day. 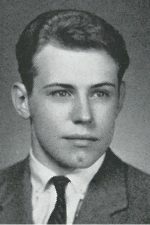 Akers, 24, was buried in Arlington National Cemetery. 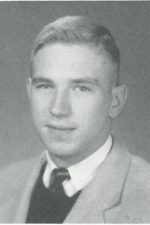 William I. Caspari III ’58 was a native of Baltimore, Maryland, where he was born in 1935. 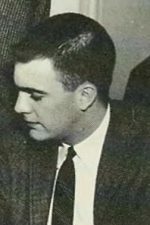 A member of Phi Delta Theta and a star lacrosse player at W&L, he was killed on Jan. 4, 1967, when his Navy P2 Neptune patrol bomber crashed into a field shortly after taking off in a light rain from Andrews Air Force Base near Washington. “I saw this big ball of fire coming down,” an eyewitness told the Associated Press. “It crashed, and flames went all over the place.” All nine Navy reservists on board perished in the weekend training mission. Caspari, 31, was the plane’s navigator-bombardier. “He liked his duty,” his mother-in-law told the Baltimore Evening Sun. Married with three sons, ages 8, 6 and 4, he was a sales representative for a chemical firm in Baltimore. He was buried in Loudon Park Cemetery in Baltimore. Louis Otey Smith ’58 was born in 1934 and raised in Richmond, Virginia, the son of a real estate executive. 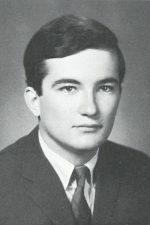 He attended Notre Dame for two years and W&L for one year, during which time he was a member of Sigma Nu and on the staff of the Ring-tum Phi. He later received a degree in journalism from Richmond Professional Institute, now Virginia Commonwealth University. He joined the Marines in 1960 and served extensively overseas, including in Vietnam in 1966. He rose to the rank of major and died on May 4, 1973, of a brain hemorrhage in Yokosuka, Japan, where he was stationed. Smith, 38, was married with a son and daughter. He was buried in Blandford Cemetery in Petersburg, Virginia. Jay Webster Stull ’60 was born in 1938 and was from Riverside, Connecticut, outside of New York. A member of Phi Delta Theta at W&L, he was also on the lacrosse team and was a member of the Sigma Society. On Feb. 28, 1968, Stull, a Marine infantry captain, was aboard a helicopter bound for Khe Sanh in Vietnam. As the chopper crossed over a ridge line, it was hit by automatic weapons fire from North Vietnamese anti-aircraft guns and crashed at full speed, rolled down a mountain, exploded and burned. All 23 military personnel on board perished. Stull, 29 and married, was buried in Arlington National Cemetery. The Jay W. Stull Memorial Award is given each year to the W&L student who attains the highest ranking at the preceding summer’s Marine Corps training camp. Walter Ludman Toy ’63 was born in 1941 and grew up in Baltimore, Maryland. He played JV basketball at St. Paul’s School in Brooklandville, Maryland, before enrolling at W&L. “Guard Walter Toy stole the ball away from Mervo with three seconds remaining in the game, and tallied a layup to give the team a hard-earned 25-24 victory,” the school’s yearbook chronicled. Toy attended W&L for one year and belonged to Phi Delta Theta. He then attended New Mexico Western College in Silver City, New Mexico. A lieutenant in the Navy, he was killed on March 26, 1969, when his F-8 Crusader jet crashed off the California coast during a tactical training flight. He was attached to Fighter Squadron 124 at Miramar Naval Air Station north of San Diego. Toy, 27, was buried in Orange Springs Cemetery in Orange Springs, Florida. 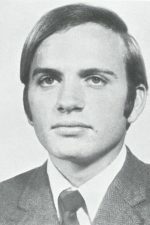 Charles Christopher Bonnet ’65 was born in 1944 and grew up in the Washington suburb of McLean, Virginia, where his father worked for the CIA. Bonnet belonged to Phi Gamma Delta at W&L. A first lieutenant in the Army, he arrived in Vietnam on Jan. 10, 1967, his 23rd birthday, and was killed two months later, on March 18, in a “friendly fire”-type incident when a tank ran over him during Operation Junction City near the Cambodian border. He was commander of an armored reconnaissance unit at the time. 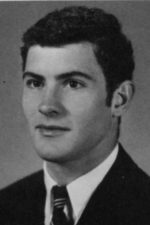 “When I think of him, I remember a sweet and kind man that was simply the best of his generation,” the sister of Jim Ledbetter, a friend of Bonnet’s at W&L, wrote on the Virtual Vietnam Veterans Wall of Faces. “I lost my friend but will always honor and keep his memory.” Bonnet was buried in Golden Gate National Cemetery in San Bruno, California. 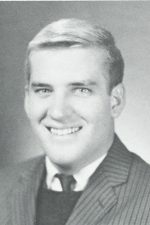 Scott Mitchell Verner ’65 was born in 1943 and lived in Pittsburgh, Pennsylvania. A member of Pi Kappa Alpha at W&L, he withdrew from school in his sophomore year. On Aug. 30, 1969, he was a 26-year-old specialist 4 in the Army and a gunner on a Chinook helicopter flying a load of supplies for Australian forces near Saigon. The chopper suddenly flipped over at an altitude of about 200 feet and crashed. “After a few small explosions, a much louder and more powerful explosion was heard, followed by many other explosions as rounds began to cook off,” according to the website of the Vietnam Helicopter Pilots Association. All six crew members died. Verner was buried in Allegheny Cemetery in Pittsburgh. He was remembered as “one of the world’s good guys” by a high school friend. “Scott was young, blond, handsome, happy and should not have died so far away,” the friend posted on the Vietnam Veterans Memorial website. James Schenler Wood ’65 was born in 1943 and grew up in La Due, Missouri, outside of St. Louis. He was a Sigma Chi at W&L and a Robert E. Lee Research Scholar. 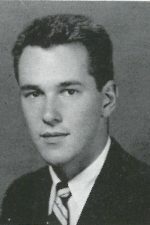 Wood did graduate work at Washington University in St. Louis and enlisted in the Army in 1966. He completed Officer Candidate School at Fort Benning, Georgia, and was an instructor there before deploying to Vietnam on April 18, 1968, as an infantry unit commander. Less than two months later, on June 6, he was killed by small arms fire north of Saigon. Wood, married and a first lieutenant, was 25. He was buried in Oak Grove Cemetery in St. Louis. The James S. Wood Prize in German is awarded annually in his honor by W&L’s German department. 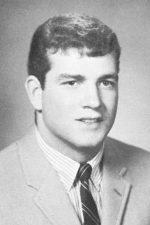 Leo John Kelly Jr. ’66 was born in 1944 and grew up in Pittsburgh, Pennsylvania. He played football all four years at W&L and was a member of Pi Kappa Alpha. He was a Marine infantry officer in Vietnam when he was killed instantly by possible “friendly fire” on May 19, 1967. “I was with Lt. Kelly when a misdirected artillery round landed in our intended ambush position just outside Gio Kinh, Vietnam,” a fellow Marine posted on the Vietnam Veterans Memorial Website. Another Marine wrote on the same website: “Kelly was one of the most honest, direct and professional Marines I had the pleasure, although too short, of serving with during 24 years of active duty.” Kelly, 23 and engaged to be married, was buried in Queen of Heaven Cemetery in Peters Township, Pennsylvania. 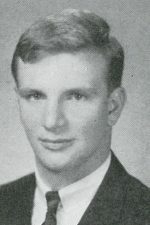 James Howard Monroe ’66 was born in 1944 and grew up in Wheaton, Illinois, near Chicago. He attended W&L with his high school friend, Rick Olson. “He was very fun-loving and kind of irreverent at times,” Olson recalled years later. 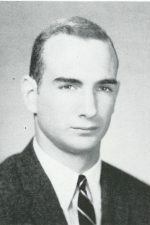 “He loved to laugh and have a good time.” Monroe voluntarily withdrew from W&L during his senior year to “provide the time for my attitude to mature.” He was drafted into the Army. A combat medic, he was killed on Feb. 16, 1967, when he threw himself on a live grenade in Vietnam. He was buried in Wheaton Cemetery at the age of 22. “The time was so short,” his mother later said. For his heroics, he was awarded a posthumous Medal of Honor on what would have been his 24th birthday, Oct. 17, 1968. “Through his valorous actions, performed in a flash of inspired selflessness, Pfc. Monroe saved the lives of two of his comrades and prevented the probable injury of several others,” his Medal of Honor citation read in part. A middle school in Wheaton and a medical clinic at Fort Hood, Texas, were named in his honor. He is also memorialized with a plaque in Lee Chapel on the W&L campus. 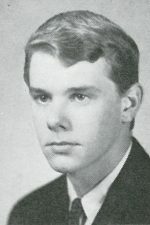 Robert Morrow Fortune ’67 was from Roanoke, Virginia, where he was born in 1945. A member of Pi Kappa Alpha at W&L, he was also in the Young Republicans and worked on the staff of the Southern Collegian. He was a lieutenant (junior grade) in the Navy when he was “lost at sea” on March 11, 1969, according to the inscription on his gravestone in Evergreen Burial Park in Roanoke. He was piloting an F4B Phantom jet on an air combat training mission off the coast of Florida when it went into a spin and crashed. Fortune and his co-pilot parachuted into rough seas 50 miles southwest of Key West. By the time rescue vessels arrived, the only sign of the pilots or their plane was an oil slick. Their bodies were never recovered. Fortune was 23. 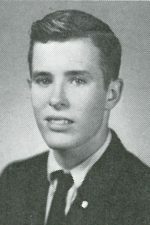 Frederick Nicholas Suttle Jr. ’67 was born in 1945 and grew up in Newport News, Virginia, where his father owned a car dealership. A member of Phi Kappa Psi at W&L, he also played lacrosse and was on the Interfraternity Council. He left school after three years, served four tours in Vietnam and rose to the rank of captain. “Fred loved the Army and what he was doing,” a fellow soldier wrote on the Virtual Vietnam Wall of Faces. 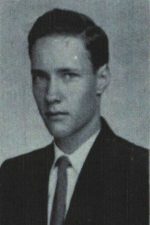 Suttle was shot and killed on June 2, 1972, while piloting a helicopter trying to rescue the crew of another chopper that had been shot down south of Kontum. “I cried the day my Dad called and gave us the news,” the daughter of an Army colleague posted on the same website. “Even though I was only 7 when I knew him, he left the biggest impression on me. I thought Fred was the greatest.” Suttle, 27 and married, was buried in Arlington National Cemetery. 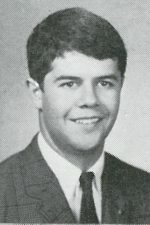 Henry Poellnitz Johnston Jr. ’70 was born in 1948 and was from Birmingham, Alabama. He was a member of Beta Theta Pi at W&L. He was killed on April 24, 1972, when his Air Force F4C Phantom jet crashed on the Gila Bend, Arizona, gunnery range during a ground attack training mission. His navigator ejected and survived. Johnson, a first lieutenant, was buried in Rosemont Cemetery in Uniontown, Alabama. He was 24 and married. The Henry P. Johnston Jr. Scholarship Fund was established at W&L in 1972 by his family and friends in his honor and memory. The following name does not appear on W&L’s Vietnam plaque because the death occurred after the Vietnam Era. However, Puller’s death was related to injuries he sustained in the war. Sources: The Library of Congress newspaper archives, Google, Ancestry.com and Lisa McCown of W&L’s Office of Special Collections & University Archives.